Recognizing that systemic issues of gender-related equity, access and climate exist in society and at the university, the Women’s Center focuses on leadership empowerment of women, women’s health, safety, and wellbeing, and gender inclusion and equity. The Women’s Center employs an intersectional approach to its work, with a particular focus on race, class and ability; collaborates with partners on and off campus in its programs and initiatives; and serves as a campus clearinghouse for gender-related programming and initiatives. The Women’s Center is located in Saint Albert’s Annex on Lapsley Lane. #32 on SJU campus map. 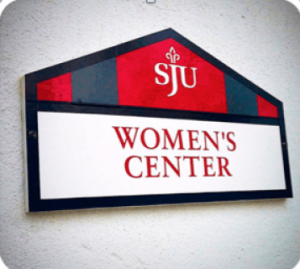 If you would like to arrange to use the space before or after regular business hours please contact womenscenter@sju.edu. The Women’s Center is available for various activities, including but not limited to, meetings, studying, workshops and social gatherings.